Buy your "The Turn of the Tide" Now! - Price £9.99 including postage Download "The Turn of the Tide" Now! Play "The Turn of the Tide" on Spotify Now! The idea for The Turn of the Tide came out of a concert performance which the organisers of Cornwall Folk Festival were kind enough to offer me at the 2016 event. I put together a set of songs in varying styles about rivers, the sea and the coast. It all went down a lot better than I expected, so I decided to record it and see how it came out... well here it is and I hope you like it. There are three of my songs here and one each by Lennie Gallant, Stan Rogers and Archie Fisher as well as six traditional songs I have sung over the years and which I learned from some of my favourite folk singers. Many thanks to my musician friends and family who accompanied me: Nick Pynn, John Rain, Sarah Mooney, Dogan Mehmet, Mannie McClelland, Alex Percy, Tigar Bell, Wayne Killius and Frank Scully. I played a Blueridge BR-163 guitar on all tracks except 9 & 12, (Lowden) & 11 (can't remember!) I also used a Fylde bouzouki, Gibson F2 mandolin, Hopf classical guitar, Nigel Chippindale's prewar Hohner melodeon, worthless old banjo and worthless old German violin. Available to book now for share of door money! (anywhere south of London, or for a fee further afield.) We offer a one hour set, or two 45 minute sets. 2018 "Thank you for a splendid evening. Get out there and sell yourselves." 2017"A lot better than I expected!" "I wanted to add belated thanks for making last Monday such a success. Hope you enjoyed it as much as we all did. Best regards,"
Stuart Reed, Brighton Acoustic Session. 2016"French guitarist Claude Bourbon, Pete McClelland along with Martin Simpson opened the Festival to make it a feast for all those “guitar pickers “out there. Pete gave up his Hobgoblin Music Chain management duties to return to his heart-felt roots and love of playing once again by delivering an inspired and very worthy, traditional performance – welcome back to the stage Pete! Your set was very good and I hope to see you do more performing now." "I thought your set was really good and a couple who were staying at our B&B also commented on how much they enjoyed your material." Clive Rooke, sound engineer Cornwall folk festival. "Whenever you find yourself hankering for some raw and unadulterated folk, traditional or contemporary, or like Melville’s narrator Ishmael "... growing grim about the mouth;" then you could do much worse than listen to the gently engossing ‘The Turn Of The Tide’ by Peter Fergus McClelland. This collection of songs covers the range of contemporary, self-penned and traditional – and the result, engaged through McClelland’s eminently listenable voice and the absorbing narratives is a rather fine piece of work. The themes take in the sea, the coast and fishing in a wealth of guises, there’s songs of loss, humour and Napoleon’s banishment to St.Helena. The Turn Of The Tide’ is a simple album with an elemental attraction. "The Turn of the Tide is a beautifully scenic album, one that like a dominating river is impossible to pull away from. Mr. McClelland sense of wonder pervades through the album like with the knowing approach of the seasoned fisherman pulling in his vessel out of the storm that is on the horizon"
Ian D Hall - Liverpool Sound and Vision. "Many thanks for the CD which I thoroughly enjoyed, a very good mix of contemporary and traditional. Looking forward to seeing you at the club." 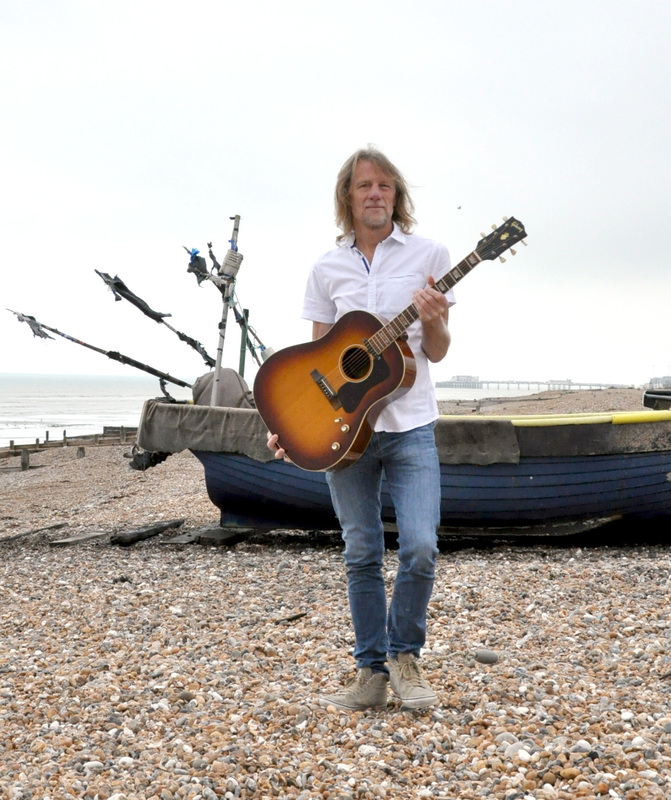 "Pete McClelland - A Sussex based singer and guitarist with a superb selection of songs of the Sea, Coast, Fishing, Rivers, Lovers and Banishment. An eclectic mix of contemporary, including self-penned, and traditional songs." "The Turn of the Tide is Pete McClelland’s second album within a few months (read our review of Carolina Sky) and came about as the result of a gig supporting Martin Simpson at last year’s Cornwall Folk Festival. Pete is joined on vocals by Dogan Mehmet with fiddle accompaniment from Nick Pynn for The Herring’s Head.. a lively cumulative children’s song from the West Country, each verse adding to the chorus list. Also featuring fiddle, the section closes with the equally sprightly Candlelight Fisherman, a song about a fisherman testing the wind to see whether he wants to go out to sea or stay in bed, collected from one of the last Thames bargeman Bob Roberts. The last in this section is a rework of The Appalachian Way, one of the Carolina Sky stand-outs, with a different mix... The final two numbers form the Coast element, first up being the jaunty fiddle-driven folk-pop Top Alex, a self-penned number in memory of the Southend pier pavilion that burned down in 2005 the day after he tried to take his family to see it. You may have already got a copy of his last album, but you should put the boat out and shore up the collection with this too."